In Flow Country, an anonymous narrator investigates a 16mm film as an archaeological record. He wonders to what degree the landscape it depicts influenced the production of the film. While scanning the stark images of a deserted landscape, the idea arises that the ‘archaeology of the present’ can be a site of production – where ecology and people play equal parts. The role of the archaeologist transforms from being the observer of a disconnected past towards becoming an immersed wonderer, actively creating future historical layers. The film forms the latest addition to an on-going series of works in relation to the Flow Country, Forsinard, Sutherland, Northern Scotland, UK. Depressive Cop (2016) by French film maker Bertrand Mandico has been released. A drepressed cop (played by Sergie Ivanov) attempts to investigate the case of a young girl, who’s distraught mother blames islanders for her disappearance. The girl reappears and the mothers strained relationship with her daughter emerges. Played by the same actress, Elina Löwensöhn, the mother and daughter blurr into one. The depressed cop is too caught up to notice. 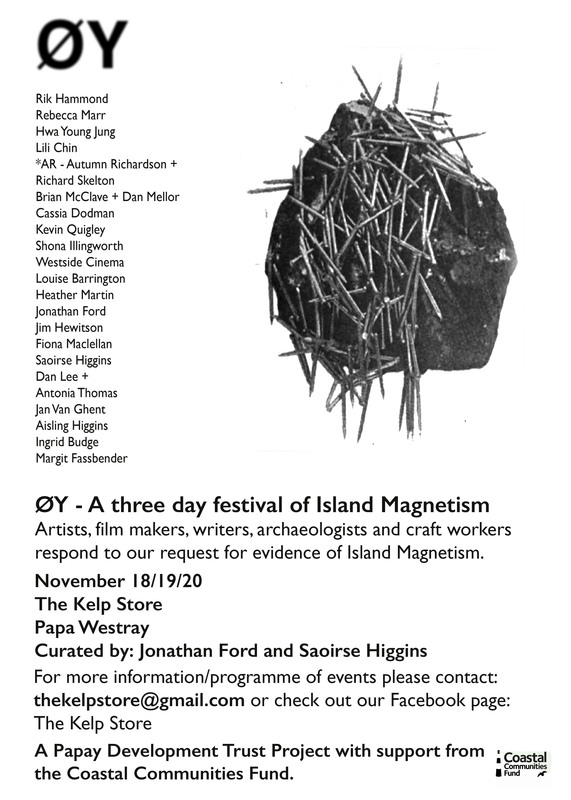 Shot on Papa Westray (Papay) in Orkney during the Papay Gyro Nights Art festival 2015, the film continues the manifeste cinématographique – International / INCOHERENCE manifest – developed by Mandico and Icelandic film maker Katrin Olafsdottir. 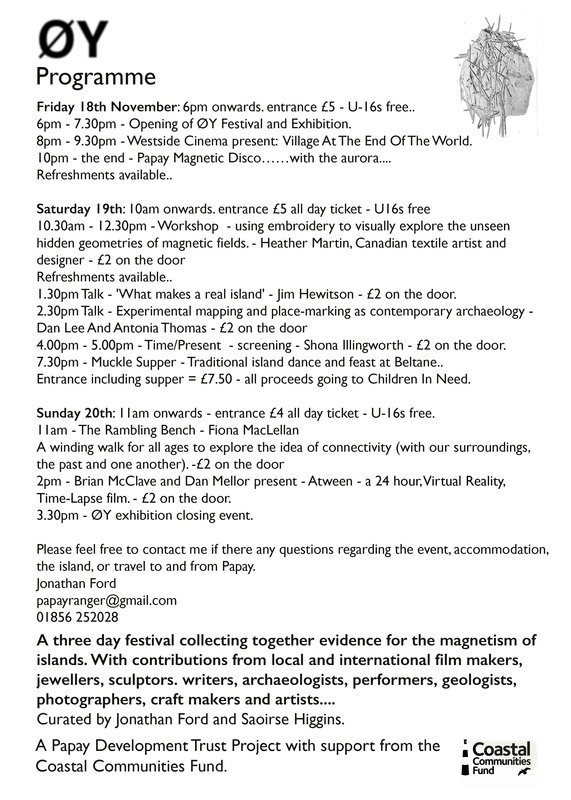 Film info here. We played extras in the final party scene film at Aalsker. During the filming I made an experimental map of Papay by walking around the island. Gathering all the fragments, encirling the island was the result of several years of collaboration, mapping and friendship on Papay. The party scene from the film formed the central node site for the walk; marking the film onto the island. The walk and map is dedicated to Sergei. A new artist book by Tonje Birkeland ‘The Characters I-IV’ has been launched. You can view selected pages on her website. We are thrilled to have our article ‘Walking (in)visible Lines: Archaeologies inbetween‘ re-published inside as part of our on-going collaboration. This beautifully illustrated book chronicles for the first time all of Tonje’s characters to date; a lifetimes work. Aline Victoria Birkeland, Tuva Tengel, Luelle Magdalon and Anna Aurora Astrup tell their stories, share their diaries, photographs and objects. A diary within a diary, photographs within photographs, imaginary within real, real within imaginary. “When you come across something, something old, as you touch it, you touch time. The air around your face carries the scent of an era, not of old and fungus but of body, powder, leather, perfume, gasoline: all the things that were there. All these unnecessary necessities that fill our lives, things that filled lives then. As you take hold of the object, you’re afraid of breaking it. Still you don’t want to let go. You inspect and sense: look, stroke, push, bend, turn and tilt. If it is wearable, you put it on. You search for the nearest mirror, making this thing a part of you. If it is too tight you hold in your stomach, you try to breathe carefully to not tear the fragile fabric across your ribs or shoulders, and as the garment finally slips down your chest you bless your small breasts. Or you curse your thighs, as the skirt refuses to be pulled all the way up – it goes no further than your knees – and this moment you swear to never run your miles again. The only mile you want to run right now is the one that can take you back in time. Clutching an object, trying it on, finding that it did fit you perfectly, without any struggle. Bending across her leather suitcase, on your knees, looking at your own reflection in an old mirror. Her sunglasses fit your face, rest comfortably on your nose. The rubber band keeps them up without too much pressure on your temples. The frames rest on your cheekbones. Imagine looking through those orange glasses. As you return your own gaze, fiction, reality and your life meet in a reflection.